An interesting campaign that focuses on the perpetrator and not the victim. Its a pretty thought-provoking campaign. What do you think? Our next round table will be held on Thursday November 25th from 12 – 1 in room 309. 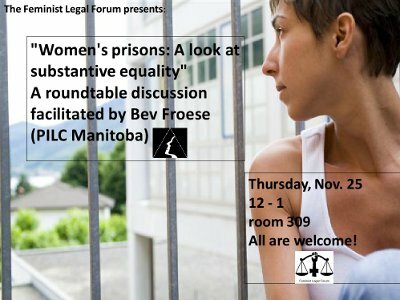 Bev Froese from the Public Interest Law Centre will be talking about women’s prisons and substantive equality. It’s going to be a look at how the law, though appearing equal, can apply unequally in certain circumstances. Bev worked with Elizabeth Fry on their Human Rights claims against the Portage Correctional Facility, she’s got a lot to say. Our last round table was such a success, it would be great if you could all come out again to listen and share your AMAZING opinions! Please feel free to read the Elizabeth Fry Human Rights Commission press release if you’d like to prepare for the round table. Beverly Froese is a lawyer at the Public Interest Law Centre of Legal Aid Manitoba. She articled at the Centre and was called to the Bar in 2002. Beverly practices primarily in administrative and civil law, with a focus on constitutional law, human rights and poverty law. She has a Master’s degree in law that focused on U.S. constitutional law and international human rights law. Beverly is a member of the Manitoba Bar Association Council, the Co-Chair of the Manitoba Bar Association Equality Subsection and is on the Board of Directors of the Community Unemployed Help Centre. happens after charges are laid? The Workshop will be presented by Crown Attorney Colleen McDuff and will provide basic legal information and resources. donating a non-perishable food item to FGWRC for women & children in need. Childcare, healthy snacks and bus tickets are available. Women & Family Law Project Funded by: The Manitoba Law Foundation. Dr Elise Chenier is an historian of gender and sexuality in twentieth-century Canada, and the author of Strangers In Our Midst: Sexual Deviancy in Postwar Ontario (UTP: 2008). Dr Chenier received her doctorate in history from Queen’s University, and is presently a member of the Department of History at Simon Fraser University. As you may have heard, FemRev is organizing the 2nd RebELLEs Pan-Canadian Young Feminist Gathering to be held in Winnipeg, May 20-23, 2011! The first gathering took place in Montreal and hosted over 500 young women from every province and territory. It was an experience that launched the RebELLEs Movement, a pan-canadian young feminist network that is feisty, active and making waves. The 2011 Gathering will work to empower young women and girls and to mobilize, energizeand strengthen the feminist movement. It will provide opportunities for women and girls to develop leadership skills, share analyses and strategies for action, collectively work to improve the lives of young women, and to work within diversity in order to make meaningful contributions to the communities we are a part of. It is an opportunity to collectivize our struggles and make create concrete plans for change. FemRev is hosting a local Consulta, a consultation process that will allow us to include various women’s perspectives and experiences in the development of the structure, content, and focus of the 2nd RebELLEs Pan-Canadian Young Feminist Gathering. These Consultas will be happening in communities across the country, as well as here in Winnipeg. The Consulta is for those who are interested in participating in the RebELLEs Gathering in May and want to share their ideas and vision for the Gathering. The RebELLEs Gathering and RebELLEs Consulta are women-only events. These women-only spaces will be open to all persons under the age of 35 who currently identify and/or live as women, as well as those who were born female who claim no particular gender identification, who are two-spirit or genderqueer. 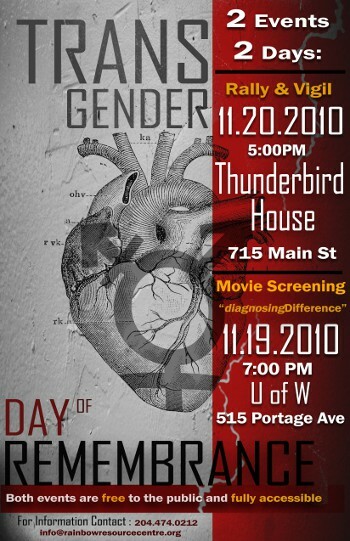 Please RSVP by Friday, November 19th if you would like to participate. Please emailrebelles@femrev.org or call 330-1685 to secure your spot! The West Central Women’s Resource Centre is a fully-accessible venue. We will have free on-site childcare and bus tickets available. Please let us know by Friday November 19th should you need either of these. If you have any allergies or dietary restrictions please us know when you RSVP so we can meet your needs.